Felice Varini creates 2D images in 3D space, producing the appearance of flat shapes when seen from a particular spot. Samples of his work are collected here and here, and an animation on his own site depicts how the illusions emerge & disintegrate based on one’s perspective. Kurt Wenner rightly calls himself a “Master Street Painter,” producing amazing images that create the illusion of depth on asphalt, concrete, and stone. On his site he discusses the impermanence of his medium, comparing fragile chalk renderings to music & calling their creation a performance. Caution! The http://www.2loop.com downloads a virus. WOW! Kurt Wenner’s works are amazing. He must have some kind of special EYES to see what will happen before the paint is applied. you find. Whether they are chalk on a street or amazing images in a microscope you discoveries are my daily stimulus to creativity. Thanks for the mentions, John. 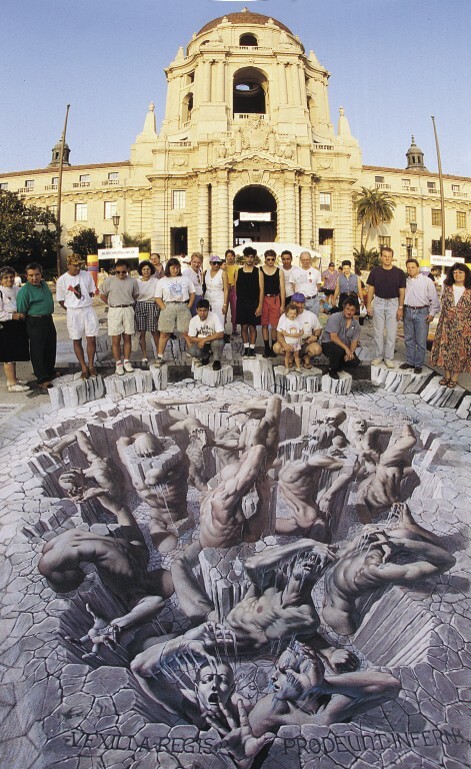 Also check out Julian Beever’s sidewalk chalk art, particularly some of his commisioned commercial pieces. You can see them at http://users.skynet.be/J.Beever/pave.htm In particular check out the swimming pool drawing and what it looks like from the “wrong” perspective. Very cool as well.